As I haven’t written a new blog for a while I thought I’d add a more succinct photo blog instead. I’m working on a written one at the moment, but it’s not quite ready yet. 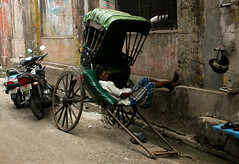 So, here are some notable images from Bangladesh taken during the past three weeks. 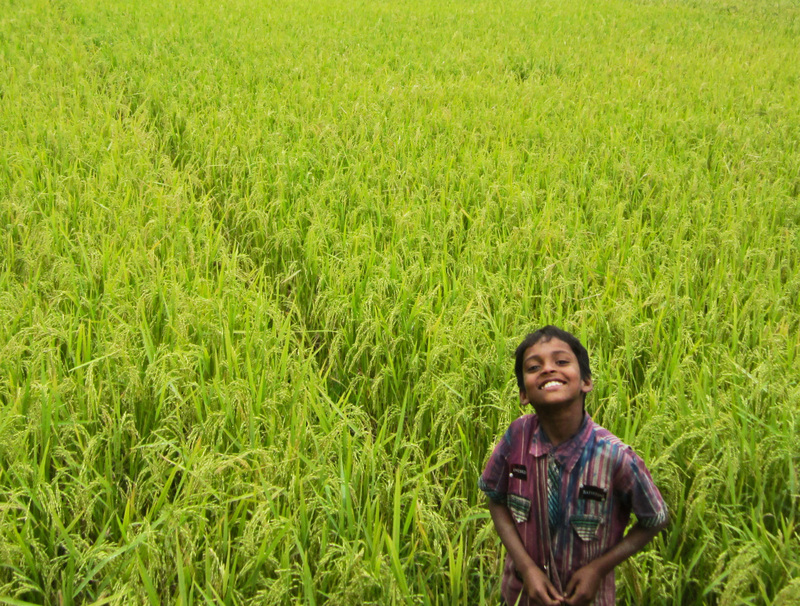 I’ve been lucky enough to experience some of Bangladesh’s finest natural beauty during that time. 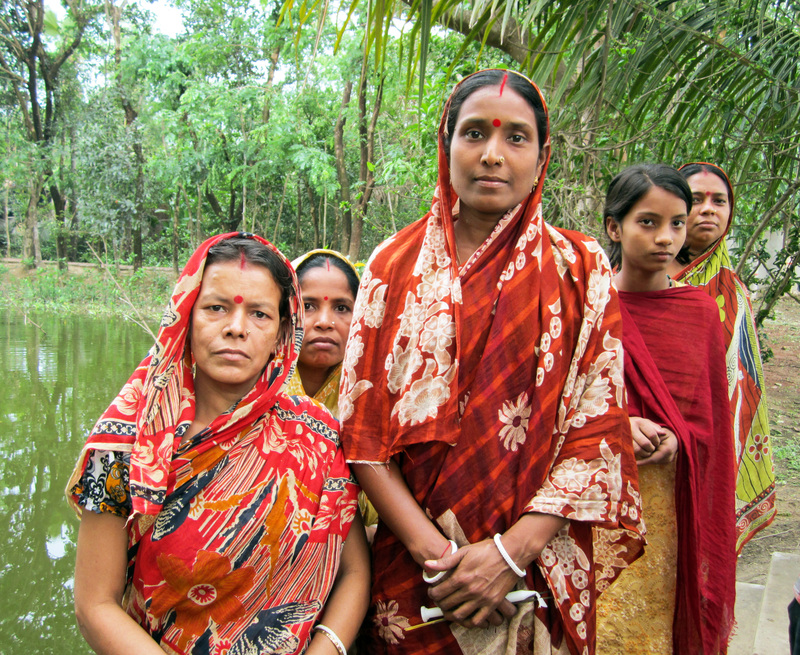 The first few were taken in the village of Koknandi, in Banshkhali district. 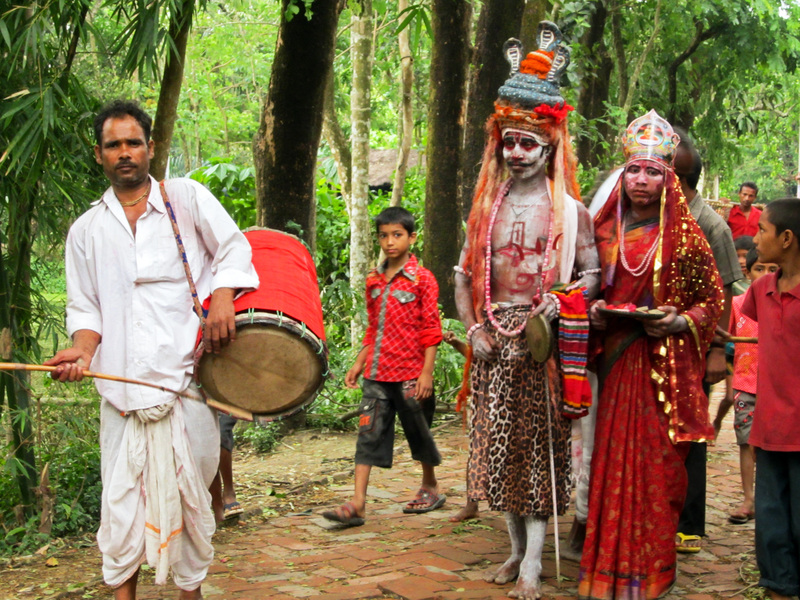 I attended the Hindu ceremony of Charak Puja. I have no idea how to provide a clear explanation of what happened or why exactly it happened, so I’ll just describe what I saw and noted through my own eyes. The excitement, yet anxiety levels rose. The festival would take place in a few hours, and I was looking forward to events with a certain degree of trepidation. In the meantime though we were treated to some fine hospitality by our hosts and were free to wander about capturing images of the stunning natural beauty of rural Bangladesh and its people. 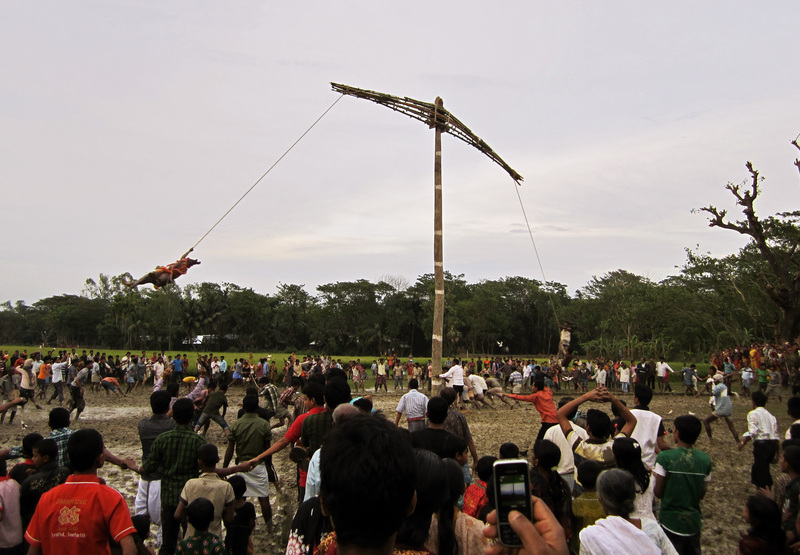 Eventually the moment came to swing the devotee around the pole. Raising the pole was not a straightforward task however, and it took the strength of around fifty men. 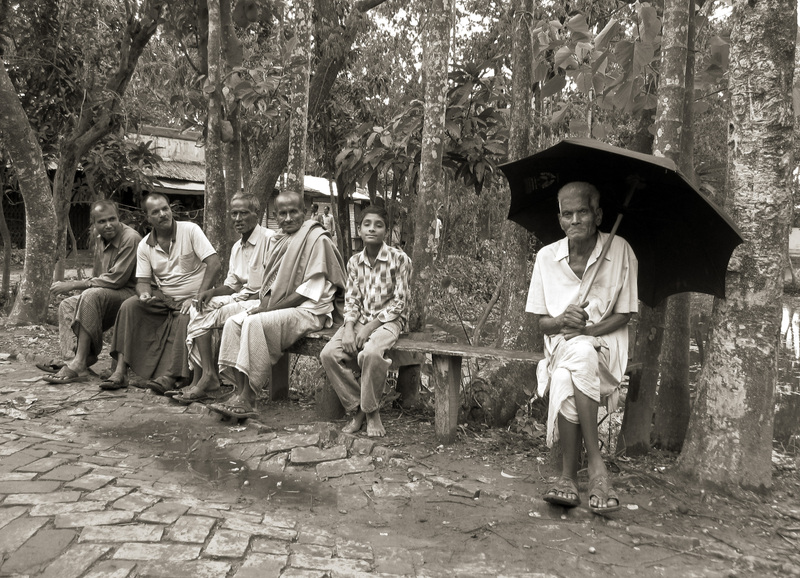 Their job was made no easier by the thick mud that had engulfed the whole area after the recent reappearance of the trademark monsoon rains that hit Bangladesh each year. 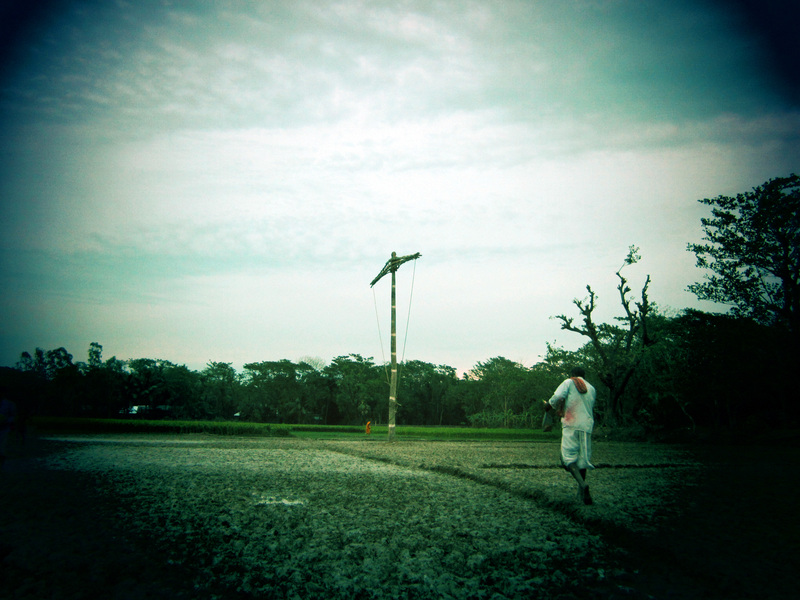 Once the pole was erected and secured in the sludge, the devotee reappeared to a rapturous reception. 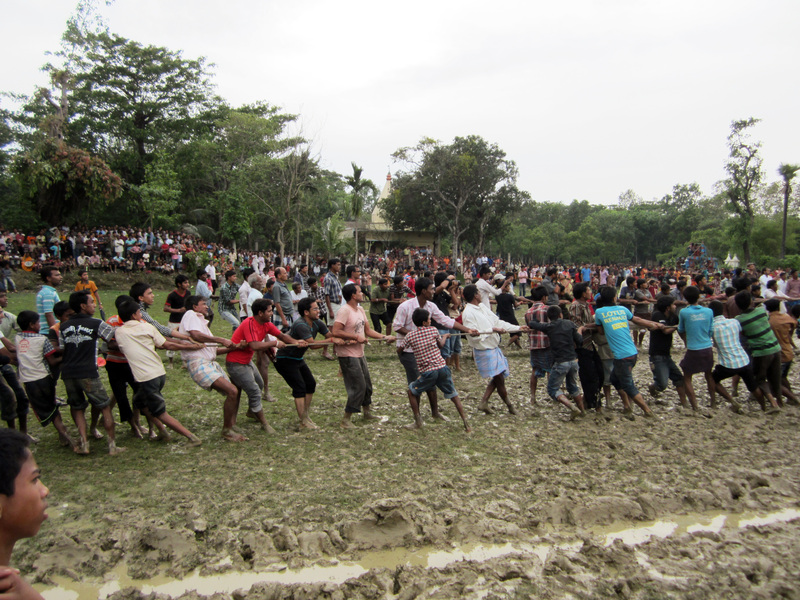 By this stage the crowd had swelled, and it seemed the whole village had come to witness the annual event. The actual climax of the whole day happened very quickly. All of a sudden the devotee was airborne and there was quite a commotion as the crowd whooped, chanted, let out mild screams, and clapped sporadically. Carefully placed men launched pigeons high into the air, which added to the mystical spectacle before us. Fortunately our devotee was spinning too rapidly to have any chance of grasping any of the birds, so none were harmed. It also became apparent afterwards that the man had not in fact been hooked during the process. 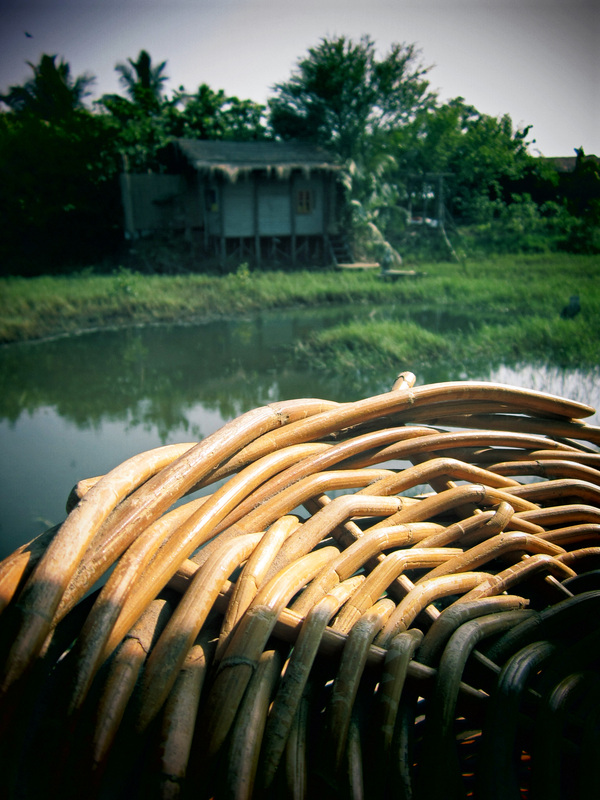 We later found out that it’s an old tradition, and in recent years has been replaced by more conventional methods…in this village at least. As I said before, I don’t possess the knowledge to explain why exactly any of this happened. However, it was a sight to behold and an authentically fascinating experience characterized by genuine warmth from our gracious hosts, who demonstrated a strong desire to ensure we were made to feel part of the experience. I took these final two photos in the aftermath of the spectacle, once some of the crowd had dispersed, and in my opinion this second image alone made the whole day worth it. 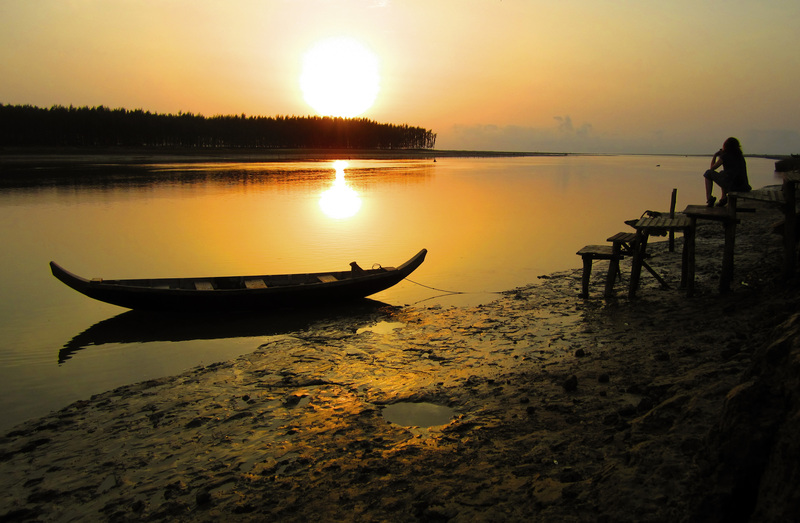 The next weekend was spent in Cox’s Bazar, a coastal town in the south of Bangladesh. It boasts the longest natural sea beach in the world and hopefully as the following photos will demonstrate, it’s a perfect location to catch a stunning South Asian sunset. 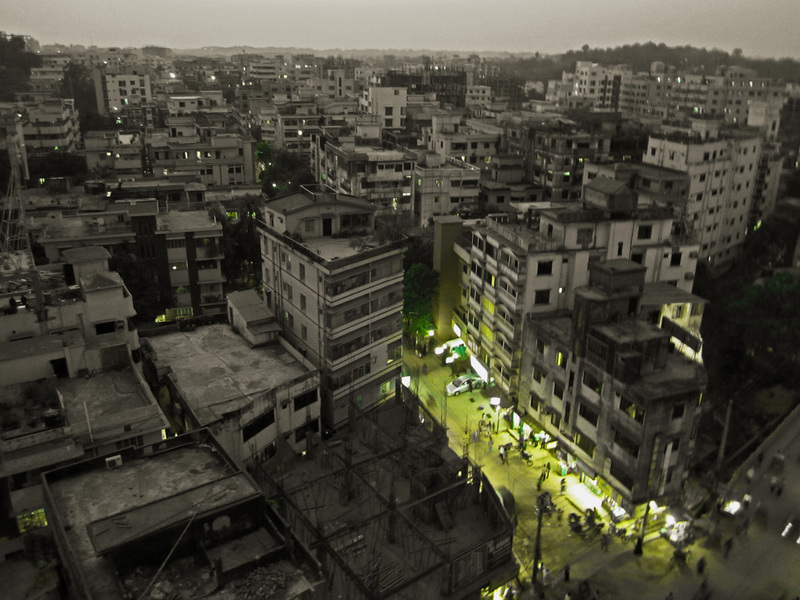 Finally, after a host of images away from the urban bustle of Chittagong, here’s a view over the city by night. This entry was posted on April 30, 2012 by johnstanlake. 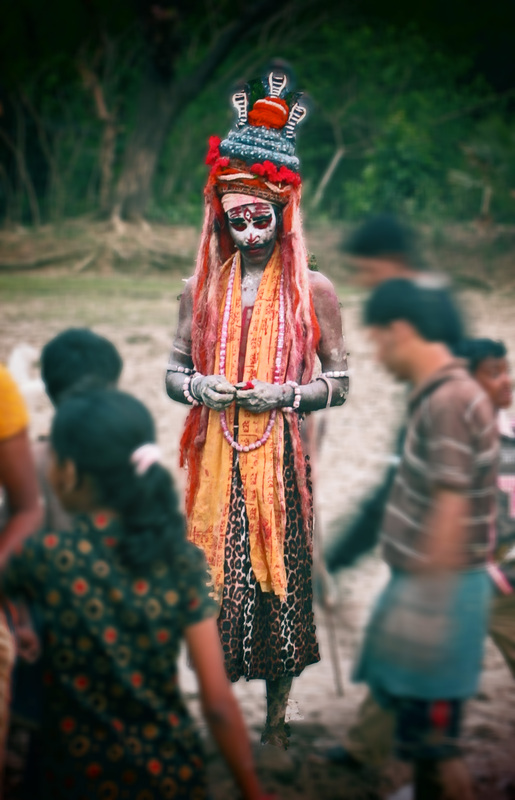 It was filed under Bangladesh, Charak Puja, Cox's Bazar, Hinduism, Photography, Puja, Sunset, Travel, Travel Photography, Uncategorized . So glad they didn’t manage to catch any pigeons John! Stunning photos. Fascinating account and wonderful photos, John. I was relieved to learn that they didn’t actually hook the man! As usual John, an interesting blog, but it is all beyond me what they get up to in these foreign parts. Hoorah for the pigeons too ! Fantastic post John! I wholeheartedly agree with your mum – very relieved for the pigeons. The hook swinging and live pigeon hunt make some of the random things we were subjected to in Rwanda seem very tame indeed. Your photos seem to be getting better by the day. The one of the boy in the grass is my favorite. Thank you for the latest blog John,great reading !. 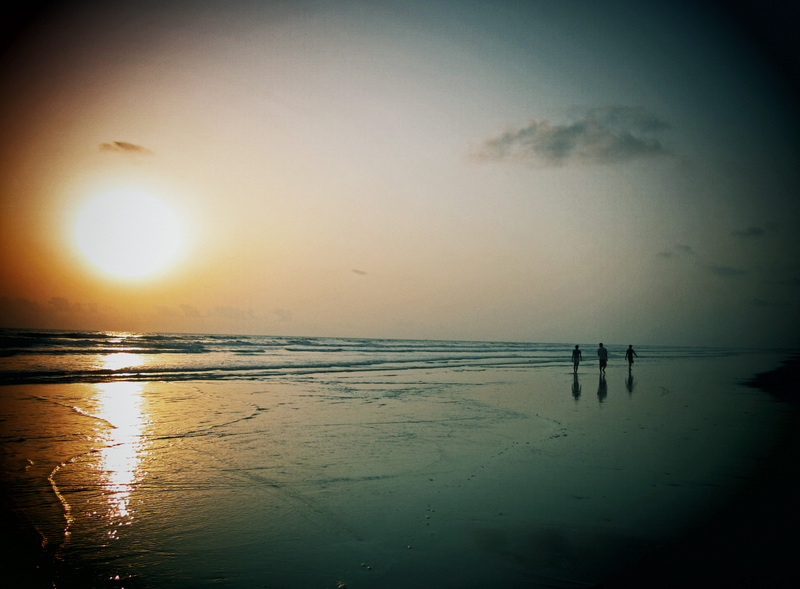 I was interested to know that Cox’s Bazaar had the longest natural beach in the world. Your photos are,as usual, GREAT !! !